This weekend was a quite one at my place. We've all been knocked out with various illnesses, and this was the time to catch up on some relax time around the house. You know the drill, lots of crawling back into bed with the newspaper, endless cups of tea, DVD marathons. Fun! However, with three small children in the house there also had to be some 'action'. So we chose baking. 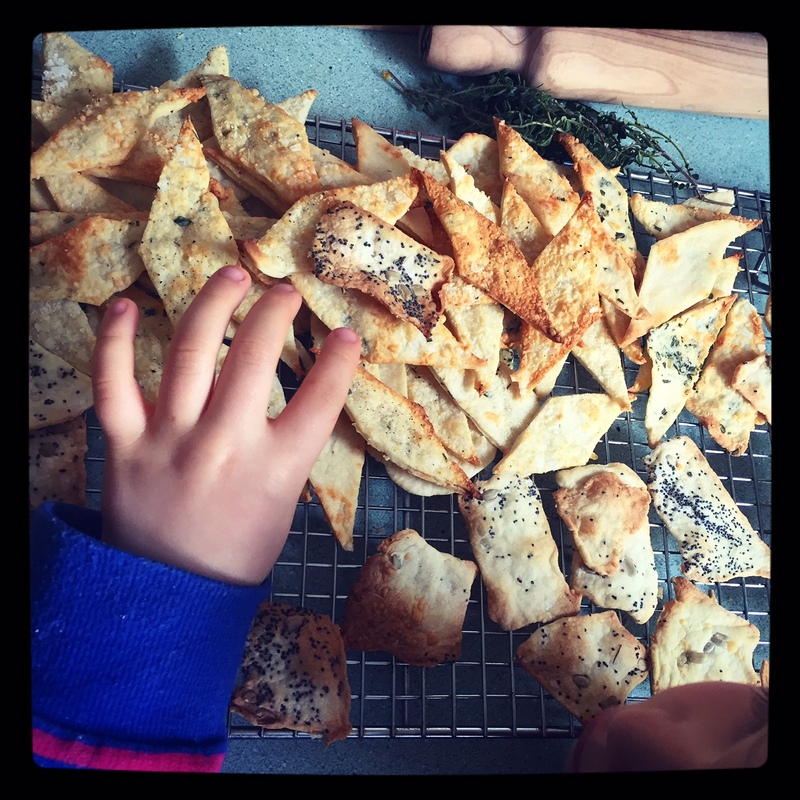 I've made my own crackers before, and honestly I can't rave enough about them. Crackers that you buy from the supermarket often have long list of 'ingredients', many of these ingredients are just numbers....hmmm. And more often than not the vegetable oil they use is unlabelled palm oil. We are massive palm oil avoiders knowing how damaging the industry is for the environment, and how animals (namely, and most famously, orangutans and sun bears) are being killed and displaced just so we can have tasty crackers or two minute noodles. I much prefer to know exactly what I'm eating, and what my kids are eating...hence organic wine, and home made goodies! **If you're passionate about palm oil, you can have a look at the P.O.I. (Palm Oil Investigations), which has a handy app to tell you if something is palm oil free, or from certified palm plantations. 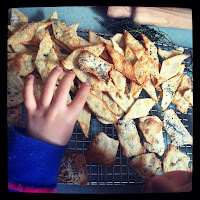 These crackers are really easy (if a little time consuming), and the result is always a winner. I've done a bit of research, and have discovered a recipe that is pretty much foolproof. I nabbed it from fellow blogger at 'The Kitchn' who seems to have quite a few nice looking recipes and a cook book to boot. I'll pop my slightly modified recipe below so that you can just get in and start making. Anyway, once the crackers were baked, there was a required 'tasting' session. 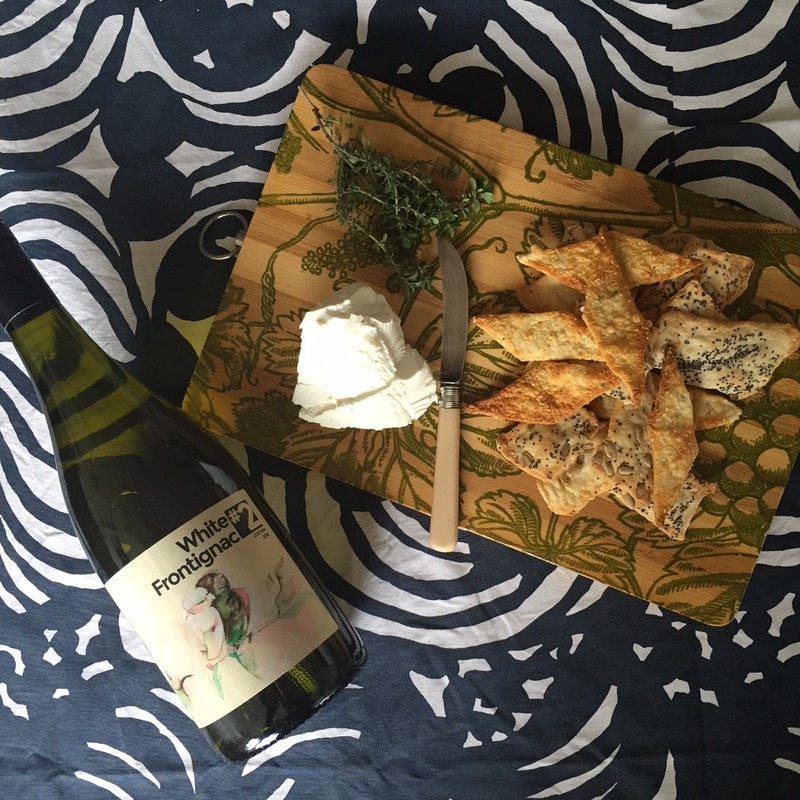 What better to have with a plate of crackers and Danish fetta cheese? A zesty white wine of course! I chose to crack open one of my faves, a White Frontignac by Temple Bruer. 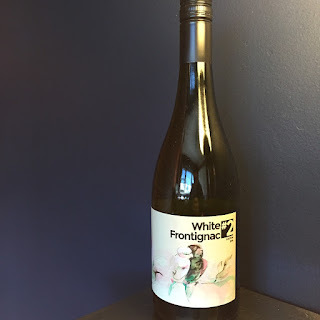 It is one of their limited release natural wines, made by Verity Stanistreet, and honestly it is good, good, good! There were only 44 dozen bottles of this wine made, so it's worth trying to get your hands on it if you can (which you can!). 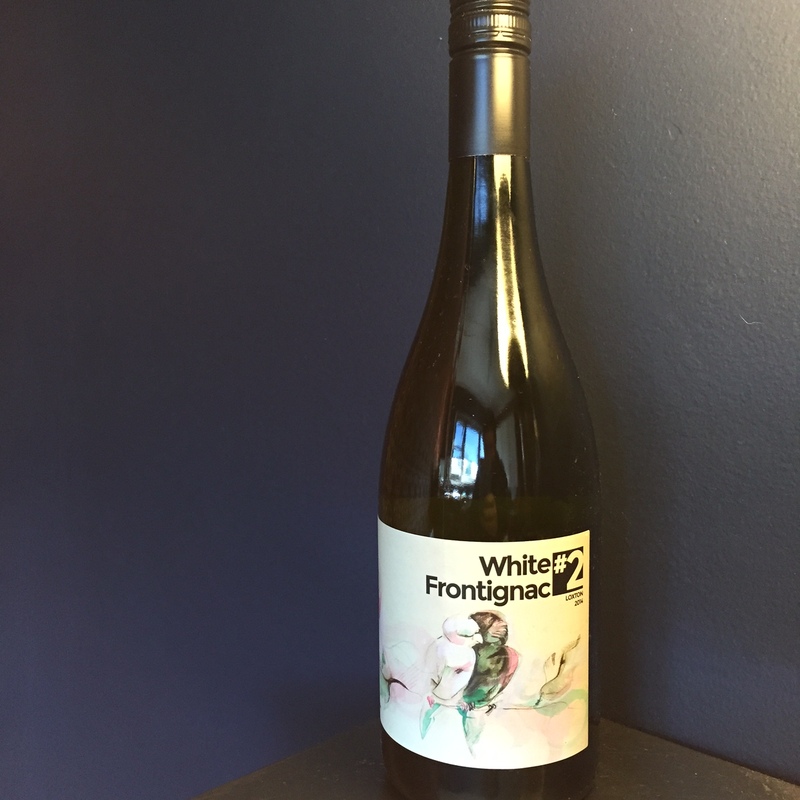 White Frontignac is an interesting drop and not a varietal that you come across often. To taste, there are notes of rose, pear and lychee which gently grip your mouth. Then the flavour palette shifts to spearmint and tangy lemon sorbet. It's quite something... a really interesting wine, in both taste and mouth feel. The wine was fermented partly on solids to provide extra texture and mouth feel. If your mouth is watering now, why not order a bottle? Line some baking trays with non stick baking paper. Add the oil and water: Stir until a soft, sticky dough is formed. If a lot of loose flour remains in the bottom of the bowl and the surface of the dough, add more water a tablespoon at a time until all the flour is incorporated. Divide and shape the dough into a square: Divide the dough into two halves and set one half aside. Sprinkle your work surface lightly with flour and set the other half on top. Pat it into a thick square with your hands. Roll out the dough: Working from the center of the dough out, roll the dough into a rectangle roughly 3-4mm thick or thinner if you prefer crispier crackers. If the dough starts to shrink back as you roll it, let it rest, uncovered, for 5 minutes and then continue rolling. Sprinkle dough with topping (optional): Brush the surface of the dough very lightly with water. Combine the seeds in a small bowl and sprinkle half of them (roughly 1 1/2 tablespoons) evenly over the surface of the dough.Press the seeds or toppings into the dough (you could even lightly roll the dough again). Cut the dough into cracker-sized rectangles: Using a pizza cutter or a sharp knife, cut the dough into individual crackers roughly 3 cm by 3 cm. Alternatively, cut the crackers into squares, diamonds, or use cookie cutters. We went pretty free form, as the kids were helping. Transfer crackers to baking tray and prick with fork: It's fine to crowd the crackers very close to each other. Prick each cracker with the tines of a fork to prevent them from puffing during baking. Bake for 12-15 minutes: Bake the crackers in the oven for 12-15 minutes, until the edges are browned. Thinner crackers will bake more quickly than thicker ones; you can remove the crackers as they brown to your liking and continue baking the rest. While the first batch of crackers is baking, roll out and cut the remaining dough. Cool and store the crackers: Transfer the baked crackers to a wire rack to cool completely. The crackers will crisp further as they cool. Store the crackers in an airtight container on the counter for 3-5 days (they won't last that long!). If you're crackers are a little old and less-than-crispy, lay them on a baking sheet and put them in a 180°F oven for a few minutes to re-crisp. TOPPINGS: I added a good couple of teaspoons of garlic power to the dry ingredients, which gives the crackers a bit of a kick. For one batch I added finely chopped herbs from the garden to the dough and then topped with finely grated parmesan cheese...DELICIOUS! The second back I topped with poppy seeds, sunflower seeds and sea salt. Scrumbo and very crispy. Other toppings could include chilli flakes, fennel seeds, pesto, or really anything you feel brave enough to try. If using a wet ingredient like pesto, you may need to adjust the amount of water or oil you add.